Environmental Health News report Russell Hume a major supplier of meat to schools, care homes and retail chains including Wetherspoon’s and the Jamie Oliver Group is under suspicion of serious food safety offences after all its meat supplies were recalled earlier this week. Suspected breaches of hygiene and labelling regulations were initially discovered on 12 January following an unannounced inspection of Russell Hume’s Birmingham plant. 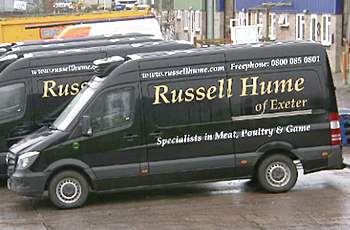 Russell Hume is a Derby-based meat supplier with seven sites across the UK describing itself as ‘one of the UK’s leading meat specialists providing’. The company had a turnover £129 million in 2015. In a statement the FSA said: ‘Following an unannounced inspection of Russell Hume’s Birmingham site on 12 January, we became aware of instances of serious non-compliance with food hygiene regulations. The FSA statement also confirms that ‘there is no indication that people have become ill from eating meat supplied by Russell Hume’. Outlets impacted by the effective shut down of Russell Hume have found new suppliers. The firms supplied by the firm include: Wetherspoon’s, Jamie’s Italian, Tiger Tiger, Marston’s pubs, and Butlins. Older PostBritish supermarket chicken show record levels of antibiotic resistant superbugs.